The Mid-Cayman spreading centre is an ultraslow-spreading ridge in the Caribbean Sea. Its extreme depth and geographic isolation from other mid-ocean ridges offer insights into the effects of pressure on hydrothermal venting, and the biogeography of vent fauna. In March/April 2010 the team on RRS James Cook voyage 44 discovered two hydrothermal vent fields on the Mid-Cayman spreading centre. The Von Damm Vent Field is located on the upper slopes of an oceanic core complex at a depth of 2,300 m. High-temperature venting in this off-axis setting suggests that the global incidence of vent fields may be underestimated. 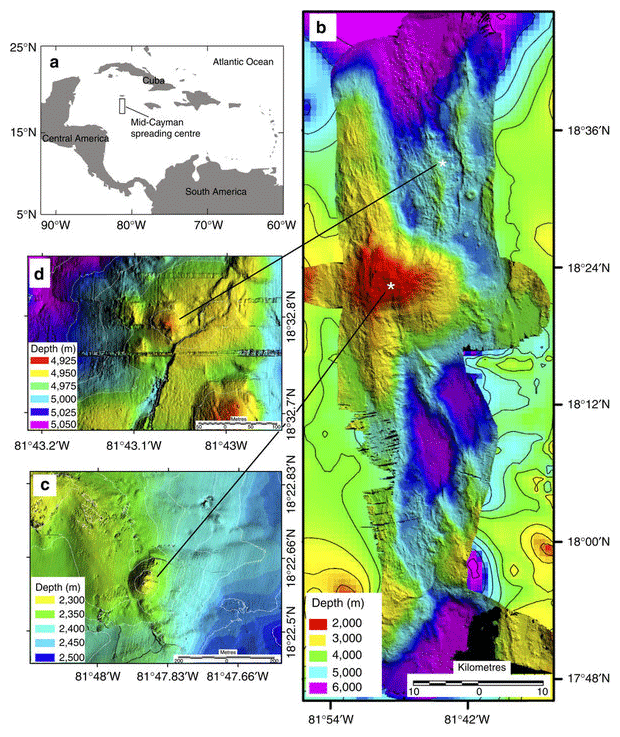 At a depth of 4,960 m on the Mid-Cayman spreading centre axis, the Beebe Vent Field emits copper-enriched fluids and a buoyant plume that rises 1,100 m, consistent with >400 °C venting from the world's deepest known hydrothermal system. At both sites, a new morphospecies of alvinocaridid shrimp dominates faunal assemblages, which exhibit similarities to those of Mid-Atlantic vents. Since their initial discovery more than three decades ago, deep-sea hydrothermal vents have provided insights into geological processes associated with seafloor spreading, the geochemical mass balance of the oceans and submarine ore-body formation. Their associated biological assemblages have yielded more than 500 new faunal species, and advanced our knowledge of species dispersal, biogeography and evolution in the deep ocean. More than 75% of the 65,000-km mid-ocean ridge system, however, remains unexplored for hydrothermal activity. Recent targets for exploration include ultraslow-spreading ridges, which were previously considered incapable of supporting hydrothermal activity as a result of their reduced magmatic heat budget. These ridges constitute 20% of the world's seafloor spreading centres. Water column signals indicative of underlying hydrothermal vents have now been detected in several locations, but so far only two vent fields have been observed directly on such ridges, on the Arctic Mid-Ocean Ridge and on the south west Indian Ridge. The 110 km-long Mid-Cayman spreading centre (MCSC) is an ultraslow ridge, located in the Cayman Trough of the Caribbean Sea (Fig. 1), and thereby isolated by 4,000 km from the contiguous mid-ocean ridge system. The MCSC has a full-spreading rate of 15 mm per year and has been active for 49 million years. The spreading axis of the MCSC presently consists of two second-order segments, separated by a small non-transform offset at 18°20′N (Fig. 1b). The depth of the spreading axis of the MCSC ranges from 4,200 to >6,000 m, which makes it the world's deepest seafloor spreading centre. As pressure of the overlying water column influences the maximum temperature at which hydrothermal fluids can vent at the seafloor, hydrothermal vent fields on the axis of the MCSC could exhibit exceptionally high temperatures, producing vent fluids with unusual physical and chemical properties.